Note: I recently watched Kahaani for a second time. I have no idea why I initially rated it 3.5 stars. This is about as good a movie can be. With each film she makes, Vidya Balan reaffirms her status as India’s best actress (one of the best in the world, in fact). 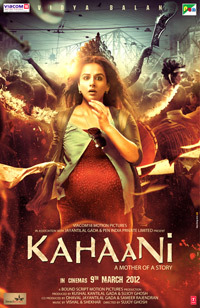 She does it again in Kahaani, a gripping thriller about identity. Balan plays Vidya Bagchi, a heavily pregnant woman from London who arrives in Kolkata searching for her missing husband. Her husband, Arnab, had been in constant contact with Vidya for the first half of his month-long assignment, but she’s heard nothing from him in two weeks. When Vidya files a missing persons report at the local police station, the head inspector repeatedly pronounces her name “Bidya,” insisting that “b” and “v” are interchangeable in Kolkata. Adding further confusion, a junior inspector, Rana (Parambrata Chatterjee), explains that everyone in Kolkata has two names: a “pet name” and an official name. Rana is the pet name that everyone uses; his official name is Satyoki. The guest house and office where Arnab was supposed to have stayed and worked while in Kolkata have no record of his having been there. Vidya gets a lead when the head of human resources at the office says that Arnab’s photo bears an uncanny resemblance to a former employee named Milan Damji, a suspected terrorist who’s been on the run for two years. Is Arnab’s disappearance a case of mistaken identity, or could he and Milan Damji be the same man? Kahaani is wonderfully atmospheric in the way it emphasizes the impossible task before Vidya. The city is crowded and unfamiliar to Vidya, who staggers in the heat under the weight of her pregnant belly. Kolkata is at its most chaotic during a climactic scene set during Durga Puja, a festival celebrating the Hindu goddess Durga, a renowned demon-slayer who also embodies maternal compassion and patience. Vidya is aided throughout by Rana, and their rapport is central to the movie’s success. Rana develops a crush on Vidya, feelings which are doomed to amount to nothing. If he succeeds in helping her find Arnab, she’ll leave, reunited with the father of her unborn child. If he fails her, she’ll be heartbroken. Vidya is perhaps more playful with Rana than she should be. But, as pointed out by Intelligence Bureau Officer Khan (Nawazuddin Siddiqui), a pregnant woman is no threat to anyone. Balan and Chatterjee are both spectacular. Balan makes Vidya tenacious within the physical limitations of her pregnancy. Chatterjee tinges the lighter moments Rana shares with Vidya with a longing for a love that can never be. One of the villains deserves a special mention: Bob (Saswata Chatterjeeas). He’s a paunchy, balding, middle-aged guy in glasses that you’d take no notice of if you saw him on the street, but it’s a bad omen whenever he shows up on screen in Kahaani. His very ordinariness makes him a chilling presence. The plot is well-paced, allowing enough time for character development and tense action scenes. The cinematography gives scenes a grainy, yellowish tinge, as though a smoggy cloud obscures Vidya’s search through the bustling city. Kahaani is an accomplished thriller that doesn’t disappoint. *Some theaters list Kahaani‘s runtime as 2 hrs. 30 min. It’s closer to 2 hours long. This entry was posted in Reviews and tagged 2012, 4 Stars, Abir Chatterjee, Bollywood, Durga Puja, Hindi, Indian, Indraneil Sengupta, Kahaani, Movie Review, Nawazuddin Siddiqui, Parambrata Chatterjee, Runtime, Saswata Chatterjeeas, Sujoy Ghosh, Vidya Balan on March 9, 2012 by Kathy. Fully agree with you. Very well made film. The long wait begins. I figure at least three months before I’ve a chance to get the DVD. Thanks for the review. I’m anxious to see this one. It’s so good that I’m going to buy the DVD when it comes out, too, jmm. I think fans of thrillers will really enjoy the setting. It’s a shame it didn’t open in more U.S. theaters. Thanks for catching my error, mukuldas. I read ur reviews on consistent basis & i honestly like them so i wanted to thank u for ur writing on hindi cinema. Besides this i have a que. within me from quite a long time so if u could plz Ans. to this just 4 sake of my satisfaction. I want to know whether ur western people too appreciate good hindi films such as Kahaani,Paan singh tomar,Vaastav,Black etc. and go to watch hindi films in good no.’s or only NRI’s are responsible 4 their int. success bcoz as per i know many of ur people still have mentality that Indian films are typical masala films full of dance no.’s and due to that they completely ignore Indian films, every other aspect of them and then mock over them on internet which really hurts me. Although I accept that every movie doesn’t req. this tinch of dance in b/w because it spoils the taste and even I personally do not like them but in India films are made by keeping in view the interest of every section of society; from poor to middle class to rich & from innocent & illiterates to highly educated and intell. people so even if story is not requiring directors have to fix in somewhere these extra things. So that’s all from my side & sorry to make it too long. Thank u and plz Ans. Thanks for writing, Vinayak! No need to apologize for writing a long comment. When I go to the theater to see Hindi movies, most of the other people in the audience are NRIs. I think there are a couple of reasons for that. First, most Americans (of every ethnicity) don’t watch movies with subtitles. A lot of people just don’t like to read subtitles while watching a movie, whether the film is from India, France, or any other country. Second, Indian movies aren’t promoted in the United States. There may be a couple of cardboard cutouts in the hallway at the theater, but that’s it. Without TV commercials, people don’t know what the movies are about. I think that commercials or other advertising campaigns would help bring non-NRIs to the theater for more serious movies like Kahaani or Black. There is always an audience for movies that are considered “artistic.” Also, having an English title helps. I’ve seen it happen numerous times where non-NRIs will buy a ticket for a movie just because the title sounds interesting. Even after they realize they’re not watching a Hollywood movie, they usually stay and enjoy themselves.